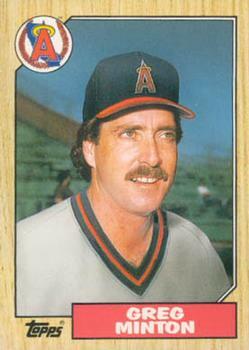 Like most young collectors at the time, the 1987 Topps Traded Set was a rarity. Actually, all traded sets to me were mythical. For all you young pups, back in my day, traded or update sets were not sold in pack form in some mega retail outlet. 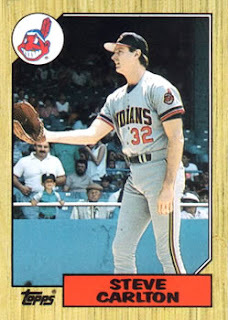 They weren’t even sold in pharmacies, little league diamond snack shacks, or even liquor stores (I bet some of you couldn’t fathom buying cards at a liquor store…). 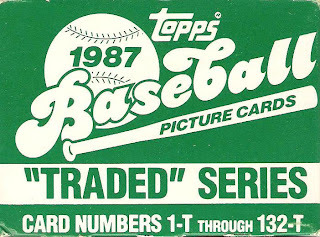 No, the only way you could get your hands on a traded set was to go to your local card store and hope they were an official dealer with Topps. Also, notice I said “set.” You couldn’t buy packs. You could only purchase the entire set, which came housed in special packaging and was printed on bleached cardstock, which I guess was either to distinguish the traded set from the main set or to imply fanciness. It's kind of hard to make basement wood paneling look fancy. 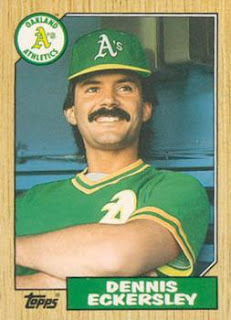 Also, those sets were usually outrageously priced because they contained such potential superstars like Kevin Mitchell, Ellis Burks, David Cone, Matt Nokes and Kevin Seitzer. So, in lieu of wasting good money better served playing Mortal Kombat or Galaga at the local pizza parlor, I passed. Well, my patience paid off because eventually most (not all) of those sets fell back to earth and flooded the secondary market. 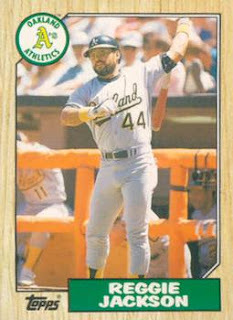 Case in point, I purchased the 1987 Topps Traded set in the fall of 2001 off of eBay for $4.50 including shipping. Not a bad deal. 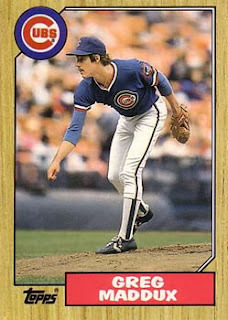 Anyways, as the dust settled, none of the aforementioned prospects really panned out except for some card showing a gangly kid on the mound with greasy hair and a wispy mustache. You know, Garry Maddox’s younger brother from another mother (and father), Greg Maddux. 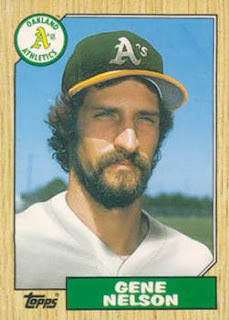 Traded sets were also known for one other great distinguishing feature, airbrushing. Some of these cards look like either Crayola was an official sponsor of Topps, or the Topps’ art department heavily invested in Mario Paint. Check out these two nuggets. Greg Minton looks like he’s trying to stare down the mess on top of his hat, and Gene Nelson looks downright pissed with his artistic treatment. I must say that I do enjoy traded sets, but I’m glad I waited 20+ years to complete them. 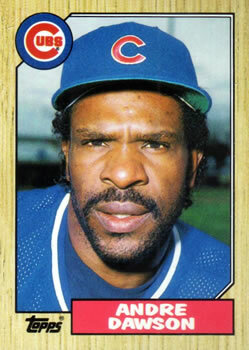 In fact, I’m working on the 1989 and 1990 Topps Traded sets right now! Thanks for the Reggie inclusion, this was an awesome way to conclude the first Reggie trifecta! One question though.. .If all traded sets came complete, how does one 'work' on completing the set, other than just buying it...? BrerSkwerl - A lot of times, collectors and dealers in the secondary market will break apart traded sets (or any set) to sell the higher "valued" cards. The leftovers will usually end up in a bargain box for sale. So, some collectors, me included, will pick up the leftovers and will try to collate the set instead of outright purchasing it.